Shopping for Despicable Me / Minions Creative Toys? Make a fun Minions vacation to remember! Start by pressing out a funky hairstyle for Phil, make more Minion friends with the surfboard, then throw an epic beach party! Head over to the tiki hut to dress up the Minions with hula skirts and other island accessories. You can also use the tiki hut to squeeze out a variety of silly shapes, then cut them with the alligator cutter. 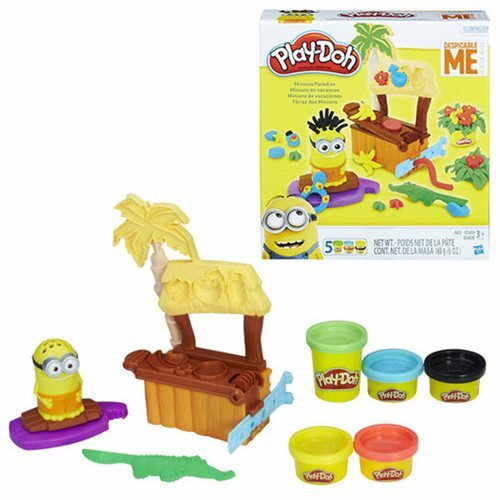 And don't forget about the banana mold; no Minions island party would be complete without Play-Doh bananas! Includes tiki playset with rail, minion with surfboard, alligator knife, and 5 cans of Play-Doh Brand Modeling Compound. Ages 3 and up.